Objectives To determine the health status of athletes before the start of an international athletics championship and to determine whether preparticipation risk factors predicted in-championship injuries. Methods At the beginning of the 2013 International Association of Athletics Federations (IAAF) World Championships, all registered athletes (n=1784) were invited to complete a preparticipation health questionnaire (PHQ) on health status during the month preceding the championships. New injuries that occurred at the championships were prospectively recorded. Results The PHQ was completed by 698 (39%) athletes; 204 (29.2%) reported an injury complaint during the month before the championships. The most common mode of onset of preparticipation injury complaints was gradual (43.6%). Forty-nine athletes in the study reported at least one injury during the championships. Athletes who reported a preparticipation injury complaint were at twofold increased risk for an in-championship injury (OR=2.09; 95% CI 1.16 to 3.77); p=0.014). Those who reported a preparticipation gradual-onset injury complaint were at an almost fourfold increased risk for an in-championship time-loss injury (OR=3.92; 95% CI 1.69 to 9.08); p=0.001). Importantly, the preparticipation injury complaint severity score was associated with the risk of sustaining an in-championship injury (OR=1.14; 95% CI 1.06 to 1.22); p=0.001). Summary and conclusions About one-third of the athletes participating in the study reported an injury complaint during the month before the championships, which represented a risk factor for sustaining an injury during the championship. This study emphasises the importance of the PHQ as a screening tool to identify athletes at risk of injuries before international championships. During international outdoor athletics championships, the incidence and characteristics of new injuries have been well described.1–5 To further expand our knowledge, we aimed to identify possible risk factors for injury during the championships. Athletes participating in championships are assumed to be healthy, that is, free of health problems at the start of a championship; however, this is not always the case. Athletes may have been injured and/or sick during preparation for the championships. In a recent pilot study of 74 athletes, 54% reported at least one health problem (an injury complaint was reported by 24%, an illness complaint by 18% and a pain complaint by only 12%) during the 4 weeks before the 2013 European Athletics Indoor Championships.6 There have been no studies examining whether carrying injuries into competition predicts injury during competition. Therefore, we aimed to determine the health status (injury complaints) of athletes before the start of an international athletics championship. We hypothesised that certain types of preparticipation injury complaints would predict injury during the championship. Our methodological investigation was to investigate the strength of different measures of preparticipation injury complaints (all complaints, time-loss complaints, a complaint severity score) as well as gender, age and event group as predictors of injury during a championship. A total cohort design was used for the study. 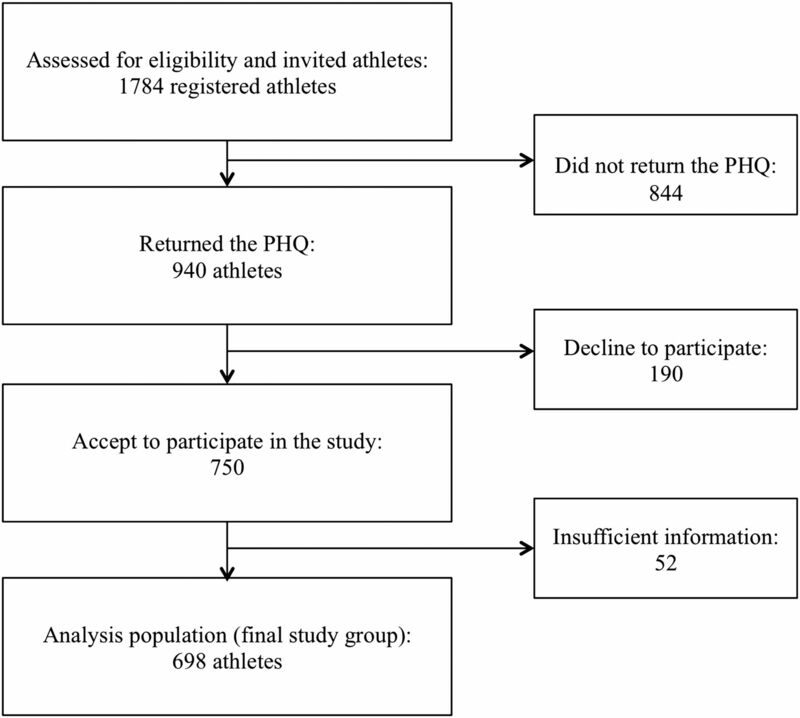 At the beginning of the International Association of Athletics Federations (IAAF) World Athletics Championships in Moscow in 2013, all registered athletes (n=1784) were invited to complete a preparticipation health questionnaire (PHQ) including individual preparticipation information (personal and training characteristics and health status during the month preceding the championship). The questions on the functional consequences of the injury complaint were formulated in line with a questionnaire used for monitoring overuse sports injuries.9 , 10 An injury complaint severity score was calculated using items 3.1, 3.2, 3.3 and 3.4 of the PHQ inspired by the calculation of the Oslo Sports Trauma Research Centre (OSTRC) Overuse Injury Questionnaire severity score from Clarsen et al 9 The response values 0–4 were allocated so that 0 represents no problems and 4 represents the maximum level for each question. An injury complaint severity score of 0 means no problem, and a score of 16 means maximal functional limitation. In the case of more than one injury complaint during the 4-week period, the athletes had to specify the main (worst) injury complaint in the PHQ and then report the additional number of injury complaints. The PHQ was available in a paper format (in English, French, Spanish, Russian), and distributed in the athlete's welcome bag, or by the team physicians or at the antidoping blood sample collection office. Athletes were asked to complete the questionnaire themselves or with the help of team physicians, if needed, and to return it to their team physician or to the designated desk in the warm-up area. During the period of the championships (10–18 August 2013), newly incurred injuries were recorded by national medical teams (physicians and/or physiotherapists) and/or by physicians on the local organising committee (LOC) using the injury surveillance system (definitions and methods) previously used during international athletics championships.2–6 , 11 To maintain anonymity and enable linking of the PHQ and injury surveillance data, each participant in the study received a specific identification number. All the national medical teams and LOC physicians were informed about the study 1 month before the championships by email and on the day before the championships during a medical and antidoping meeting. Preparticipation injury complaints asked for by self-reporting were defined as “injuries or physical complaints (such as pain, ache, stiffness, swelling, instability/giving way, locking or other symptoms) that athletes had had in the four weeks prior to the championship, even if this had not had major consequences for athlete's participation in normal training and/or competition.” In-championship injury was defined as proposed by the International Olympic Committee consensus12 and used during the three previous IAAF World Championships.2–4 An injury was defined as “all musculoskeletal injuries (traumatic and overuse) newly incurred during competition or training regardless of the consequences with respect to the athlete's absence from competition or training.”2 , 12 A time-loss injury was defined as one that “leads to the athlete being unable to take full part in athletics training and/or competition the day after the incident occurred.”12 Similarly, for a preparticipation injury complaint, a reduced participation injury complaint was defined as one that “leads to the athlete being unable to take full part in athletics training and/or competition the day after the incident occurred”; it corresponds to the responses “Yes, reduced participation” and “Yes, I cannot participate” to question 1 of the PHQ and/or “Minor/Moderate/Major/No training” to questions 3.1 and/or 3.2. Although the PHQ also included items on illness complaints, this study focuses on injuries: preparticipation injury complaints and in-championship injuries. Data on illness complaints were not included in the present analyses. The athletes’ gender, date of birth and nationality were used only to avoid duplicate reporting from team and LOC physicians, and to provide descriptive data on athletes’ characteristics. Information about the purpose of the study and the procedure was provided to the athletes in their welcome bags or by medical teams. All athletes were free to refuse the use of their data. All PHQs and injury reports were stored in a locked filing cabinet and were made anonymous after the championships. The confidentiality of all information was ensured so that no individual athlete or national team could be identified. Ethical approval was obtained from the Saint-Etienne University Hospital Ethical Committee (Institutional Review Board Information: IORG0004981). For the PHQ data, the response rate and completeness of the PHQs were assessed, and the athletes’ characteristics and injury complaints were analysed using descriptive statistics.6 Analysis of the non-responders was performed by comparing their distribution of home continent, event group, gender and age with the final study group. For the in-championship injury surveillance, the response rate, coverage, and injury incidence calculations and comparisons were analysed in accordance with previous injury surveillance studies in athletics4–6 , 11 using a list of athletes provided by the IAAF and the internet database (http://www.iaaf.org/competitions/iaaf-world-championships/14th-iaaf-world-championships-4873). For the final risk factor analyses, the PHQ data were recoded into the four variables “any injury complaints” (y/n), “reduced participation injury complaints” (y/n), “gradual-onset injury complaints” (y/n) and the injury complaint severity score (0–16). We first performed analyses with simple models (logistic regression analyses with one explanatory variable) and thereafter analyses with multiple models (logistic regression analyses with several explanatory variables) with any in-championship injury (y/n) and in-championship time-loss injury (y/n) as outcomes. The explanatory variables were gender, age, home continent, event group (following event group categories from Timpka et al 13) and preparticipation injury complaints. The multiple models were calculated using backward elimination of non-significant variables (ie, variables with p≥0.05 were eliminated stepwise). The Statistical Package for the Social Sciences (SPSS) for Windows V.21.0 was used for the analyses. All statistical tests were two-sided and outcomes with p<0.05 regarded as statistically significant. From a total population of 1784 registered athletes, 940 (52.7%) were reached to provide their informed consent to participate in the study; 750 athletes (42% of the total population) accepted. Fifty-two (2.9%) PHQs did not provide sufficient information to classify the athlete (eg, missing date of birth, event); 698 (39.1%) athletes were included in the study (figure 1). Analysis of the non-responders did not show any meaningful differences between the final study group and the non-participant athletes with regard to gender, age category and event groups; differences did exist for continents (slightly increased primary non-participation among Asian, North American and African athletes (p<0.001); online supplementary table S1). The characteristics of the 698 athletes are reported in table 1. With regard to in-championship injury surveillance, 42 of the 102 national teams (41.2%) that had medical teams took part, covering 588 athletes (84.2%). The response rate for the injury report forms was 91%. None of the participating athletes refused to allow their injury data to be used for scientific research. Flow chart of athlete enrolment and analysis population (PHQ, preparticipation health questionnaire). Two hundred and four of the 698 athletes (29.2%) reported an injury complaint during the month before the championships; 108 reported having only one injury complaint, 61 reported two injury complaints or more, and 35 did not provide the total number of injury complaints. The characteristics of the main (worst) injury complaints are displayed in table 2, the distribution and incidence according to the event groups in table 3 and body location in table 4. One hundred and twenty-six athletes reporting injury complaints (61.8%) reported that the injury complaint problem did not affect their ability to participate in athletics (table 2). The most frequently reported mode of onset was gradual (49.2%), followed by sudden/overuse (36.5%). Only 9.9% of the preparticipation injury complaints were caused by trauma. Almost half of the injury complaints (44.6%) had lasted for more than 4 weeks. There was a tendency for a higher proportion of gradual-onset injury complaints (61.7%) among those lasting for more than 4 weeks, and a higher proportion of sudden-onset injury complaints (50%) among those lasting for less than 2 weeks (p=0.07). At the start of the championship, 134 (65.6%) of the 204 athletes reported no or minor discomfort during training or competition caused by the injury complaint, 14 reported major discomfort and 3 were unable to participate. Forty-nine (7%) athletes reported at least one in-championship injury. A total of 64 injuries were recorded, representing an incidence of 91.7 injuries per 1000 registered athletes (95% CI 70.3 to 113.1), including 35 time-loss injuries (54.7%). The most frequent location of injury was the thigh (33.3%), followed by the lower leg (20.6%). Hamstring strain (20.3% of injuries and 25.7% of time-loss injuries) was the most common diagnosis. The most commonly reported cause of injury was overuse (57.1%). Using all in-championship injuries as the outcome (ie, any injury; y/n), the simple models showed that all categories for reporting an injury complaint in the month before the championship were associated with an increased injury risk: any injury complaint (OR=2.09; 95% CI 1.16 to 3.77; p=0.014), reduced participation injury complaints (OR=2.53; 95% CI 1.39 to 4.61; p=0.002), gradual-onset injury complaints (OR=2.72; 95% CI 1.38 to 5.36; p=0.004), and the injury complaint severity score (OR=1.14; 95% CI 1.06 to 1.22; p=0.001; table 5). In the analyses of the multiple models, only the injury complaint severity score remained associated with in-championship injury (OR 1.14; 95% CI 1.06 to 1.22; p=0.001; table 5). Restricting the outcome for the examinations to in-championship time-loss injuries only (ie, time-loss injury; y/n), the analyses using simple models still showed that reporting injury complaints in the month before the championships was associated with increased injury risk, but only for gradual-onset complaints (OR=3.92; 95% CI, 1.69–9.08; P=0.001) and the injury complaint severity score (OR=1.12; 95% CI, 1.02–1.23; P=0.001) (table 5). In the analysis of the multiple models, only the gradual-onset injury complaints category remained with an almost fourfold increased injury risk (OR=3.92; 95% CI, 1.69–9.08; P=0.001) (table 5). The main findings of this study were as follows: (1) about one-third of the athletes involved in this study and participating in an international athletics championship reported an injury complaint during the month before the competition; (2) almost two-thirds of these athletes (61.8%) stated that this injury complaint did not influence their participation; (3) athletes who reported a preparticipation injury complaint had twice the risk of an in-championship injury; (4) those who reported a preparticipation gradual-onset injury complaint had an almost fourfold increased risk of an in-championship time-loss injury; (5) the preparticipation injury complaint severity score was associated with an increased in-championship injury risk. Having an injury complaint during the month preceding an international athletics championship represented a risk factor for sustaining an in-championship injury. Our results showed that the injury complaint severity score predicted sustaining any injury during the championships according to the multiple model (logistic regression analyses with several explanatory variables), suggesting that having an injury complaint before the championships interferes with preparations and predisposes athletes to an injury during the championships. Injury complaints during the past month may have delayed the athletes’ physical preparation and training and affected their ability to perform optimally at the championships, leaving the athlete more at risk of injury. Therefore, the injury severity score could be a good method for predicting which athletes are at increased risk of sustaining an injury during the championships, but not the severity of that injury. A gradual-onset injury complaint was strongly associated with the risk for sustaining a time-loss injury at the championships. These measures of preparticipation injury complaints thus seem to have the highest validity with regard to impact and relevance in athletics. These results support the further development of functional consequences assessment of injuries to better define the severity in addition to the duration of time loss.9 , 22 The duration of time loss may not be an appropriate measure of the severity of an injury for athletes,20 , 22 because many athletes continue to train and compete despite being injured.9 , 10 , 15 , 22 The severity score (or functional consequences assessment) may help to better define the magnitude of the functional consequences for athletes. However, more research is needed to identify a cutpoint whereby the severity score denotes a clear injury risk. We faced methodological challenges in reaching out to more than 200 national teams with native languages not covered in our translations of the information and questionnaire. There was also lack of trust in our confidentiality measures which could in part explain the proportion of non-responders. We noted a lower response rate among North American, African and Asian athletes, which indicates that language, social or other cultural disparities were involved to some extent. Furthermore, some athletes and team medical personnel voiced concerns about filling out forms about personal injuries at a time close to the most important competition of the year. This is hard to circumvent when collecting data during a championship. Our response rate was lower than that of a previous pilot study (60.6%),6 but the pilot study was a European indoor championship with a smaller and more homogeneous study population with less language and cultural differences. For future studies, methodological factors must be mastered in order to increase the response rate (improving the information about the study and its interest for athletes, increasing the number of languages, developing informatics support rather than the paper form). Second, this study combined two different methods for collecting injury data: athletes’ retrospective self-reports and medical attention at the championship. Although a detailed definition of injury complaint was given at the start of the PHQ, athletes could have misunderstood this.9 Furthermore, self-reported data might provide a limited description of injuries; data on the exact location (including type, severity and cause) and functional consequences should preferably be reported by medical practitioners. In addition, injuries reported at the championships by national and LOC medical teams might not all be new index injuries. On review of the data (not presented in this study), we noted that athletes reported an injury complaint in the PHQ and then the same problem was reported by the medical team as a new injury incurred during the championship. This observation does not affect the results in this study but indicates an area where the method of reporting needs to be improved to distinguish between, for example, recurrence and exacerbation, because gradual-onset injury complaints were the best predictor of injury. Also, the complete burden of injuries affecting the athletes is not taken into account fully. Third, the retrospective design of the PHQ could represent a recall bias, although this should have been minimal as we asked the participants only about the 4 weeks immediately before the competition.6 The content and characteristics of the PHQ should be analysed further and validated in a future study. A self-reported PHQ was feasible to determine the preparticipation health status of athletes before an international championship. Moreover, these data can help to determine preparticipation risk factors and help identify which athletes may be at increased risk of injuries. About one-third of athletes participating in the study reported an injury complaint during the month before the championships. These athletes were at twice the risk of an in-championship injury. In addition, athletes who reported a preparticipation gradual-onset injury complaint were at an almost fourfold increased risk for an in-championship time-loss injury. The preparticipation injury complaint severity score was associated with a general increased risk for injury. During previous international outdoor athletics championships, injury incidence has been about 100 injuries per 1000 athletes. The most frequently reported injury has been thigh strain, especially hamstring strain, and overuse has been the predominant cause. To better understand what causes injuries during a championship, the European Athletics Association and the International Association of Athletics Federations encourage teams to administer a valid athlete self-reporting preparticipation health questionnaire. During the month before the championships, about one-third of athletes involved in this study were troubled by an injury complaint. Athletes who presented with a preparticipation injury complaint were at twice the risk of sustaining an injury and/or time-loss injury during the championships. Athletes who reported a preparticipation gradual-onset injury complaint were at an almost fourfold increased risk for an in-championship time-loss injury. Up-to-date information on the health status of athletes is important. National medical teams should obtain health status data during the month before and at the start of the championships. We recommend a routine preparticipation health questionnaire for athletes and medical teams before the championships in order to screen for athletes at risk of being injured. The authors highly appreciate the cooperation of the team physicians and physiotherapists and the local organising committee of the 2013 IAAF World Championships who volunteered their time to collect the data for this project. The authors would also like to thank Jan Kowalski for his help with the data support, Ben Clarsen, Astrid Junge, Margo Mountjoy and Kathrin Steffen for their help with the development of the preparticipation health questionnaire, and Mathieu Oriol and Vincent Pichot for their contribution to the statistical analyses. Contributors J-MA and PE made substantial contributions to the development of the project. J-MA, JJ, OR and PE made substantial contributions to the conception and design of the study. J-MA, JJ, OR, AK and PE were involved in data collection. JJ, TT, OD, AS and PE were involved in the analysis of the data. J-MA, JJ, TT, OR and PE made substantial contributions to data interpretation. PE made a substantial contribution to the drafting and writing of the article. All authors were involved in revising the manuscript and final approval of the version to be published.